SureLock® Rope Lock can prevent “rigging runaways” and with an indicator your flyman will know if the set is balanced, batten heavy or arbor heavy. One of the SureLock safety features is it will not open if the set is more than 50 lbs (22.7 kg) out of balance, per ANSI E1.4. Indicates if the set is balanced, batten heavy or arbor heavy. 10″ (254 mm) handle, powder coated ductile iron, contoured for comfort and ease of use. Two iron cams grip rope with socket head adjustment screw for 5/8″-1″ (15.9 mm – 25.4 mm) rope. Adjustment screw has a nylon tip for quiet operation. Integral ears for optional padlock. Vinyl coated steel oval locking ring. May be used on 6″ (152.4 mm) centers. For use in new projects or as an upgrade to existing rigging systems. Rope locks are not designed to hold an imbalance of more than 50 lbs. (22.7 kg) per ANSI E1.4, or as a speed control. Rubber bumper to quiet handle when it is opened. 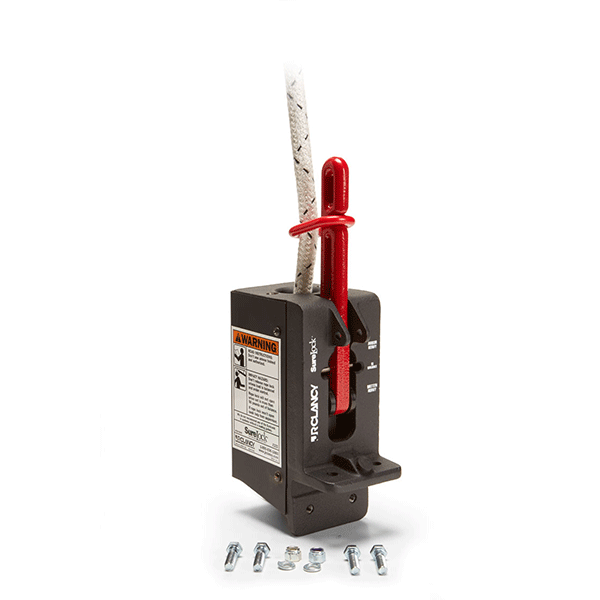 ope locks are not designed to hold an imbalance of more than 50 lbs. (22.7 kg) per ANSI E1.4, or as a speed control. RWL: RWL is maximum load that can be applied to a block which is in “like new” condition and has been properly installed, maintained and operated.